I’ve written before about Opposite in the Victoria Quarter in Leeds, and I don’t normally write about places a second time, but this story needs telling. I spent yesterday morning trudging round the centre of Leeds with the rest of Yorkshire looking for elusive Christmas presents, things for those people who’ve got everything and need nothing. The tough ones. There’s only so much time I can spend doing the retail thing, and even making a break for Crash Records didn’t seem to help, so I went to the Opposite kiosk in the Victoria Quarter for a coffee instead. I ordered a double espresso, and the barista carefully measured out the correct dose of coffee, tamped it down well and set the machine up. He let the hopper and the cup warm through before pulling the shot. The coffee poured down, a dark brown stream, a crema forming in the cup. The barista looked a little unsure, and peered into the cup. He then threw my coffee down the sink. “What was wrong with that?”, I asked. He explained that he thought the shot was too thin because it drew through the grounds five seconds too quickly and therefore lacked the body they’re looking for. It would have tasted weak, he told me, so it had to go. They were using a new winter blend and were still getting used to it, and things like the amount of moisture in the atmosphere and the temperature affect how the coffee draws. I was astounded. Such attention to detail. Such care. Incredible stuff. This is coffee making as an artisan craft. I mentioned that I’d never seen anybody do that in Starbucks and got a knowing glare in return. 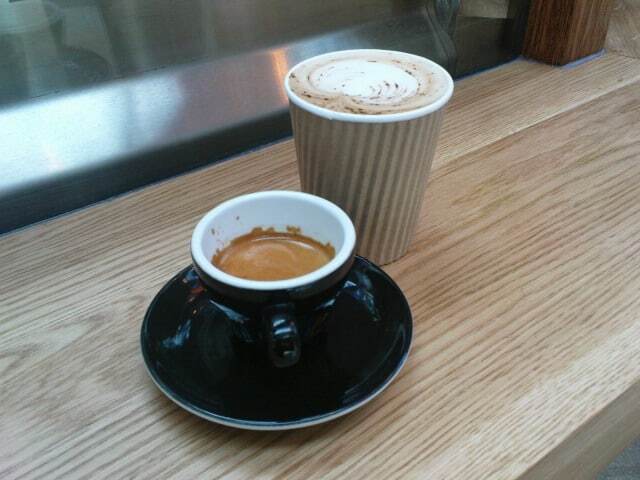 The espresso was superb – chocolatey and bitter, a definite winter, cold weather feel to the roast, no astringency. It tasted like the beans had been treated well and hadn’t been overworked. They’d just given up their richness and done their job. There really is no better coffee in Leeds. Right it worked I jealous of your coffee shop unless you meant it as a sort of public service, you know a if you are ever in Leeds and looking for the perfect espresso sort of thing. Attention to detail… and a waste of resources.. Hopefully the learned quickly! It looks and sounds like it was tasty though! Katja – everything takes practice, and a couple of wasted shots is worth producing something great. An espresso that's too thin deserves to end up down the sink. glad to hear you had quality coffee! I worked as a barista and there definitely is a difference to a "good" espresso shot! Nothing like the perfect cup. I'm wishing it was on my desk right now.